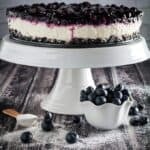 A truly simple, easy to make gluten free No Bake Cheesecake with Blueberry Topping that doesn’t require any time in the oven. This deliciously creamy no bake dessert is perfect for summer days when it’s just too hot to cook, but you still want something sweet to eat! I think I can confidently say that my favorite food is cheesecake. 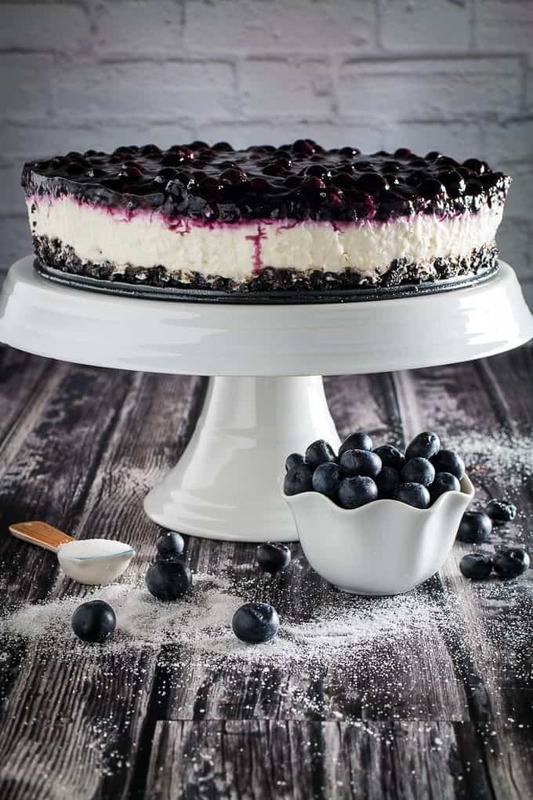 The creamy and sweet combination of cream cheese and sugar, adorned with a glaze of fresh berries. Does it really get any better than that? I don’t think so. This recipe calls for a gluten free crust, and requires zero time in the oven. That’s right, no baking at all! Making this the perfect recipe for those lazy summer days when you really don’t want to turn the hot oven on. Or, those lazy summer days when you really, really want cheesecake, but can’t bring yourself to a.) go through the many steps it takes just to bake one, or b.) get dressed and go to the store to buy one. Hey, I’m right there with you. 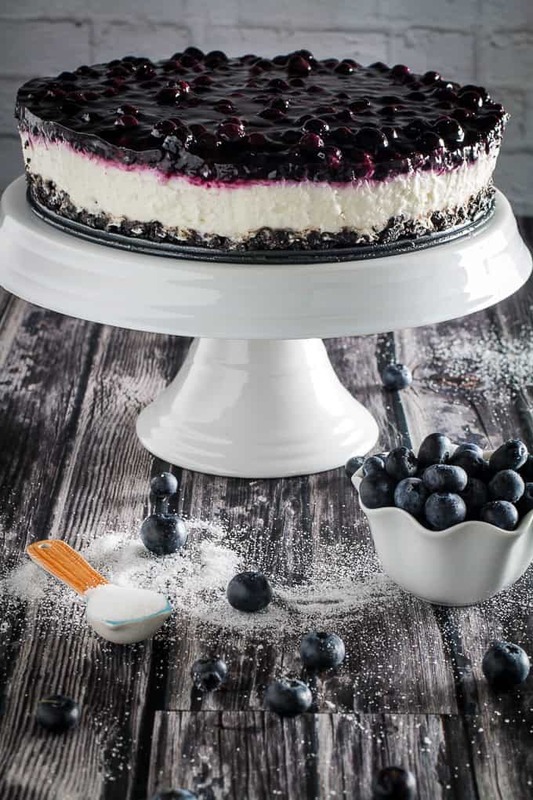 Not only will this no bake cheesecake satisfy your lazy summer dessert cravings, it’s also the perfect last-minute dessert to bring to a party. It takes almost no time to throw together! 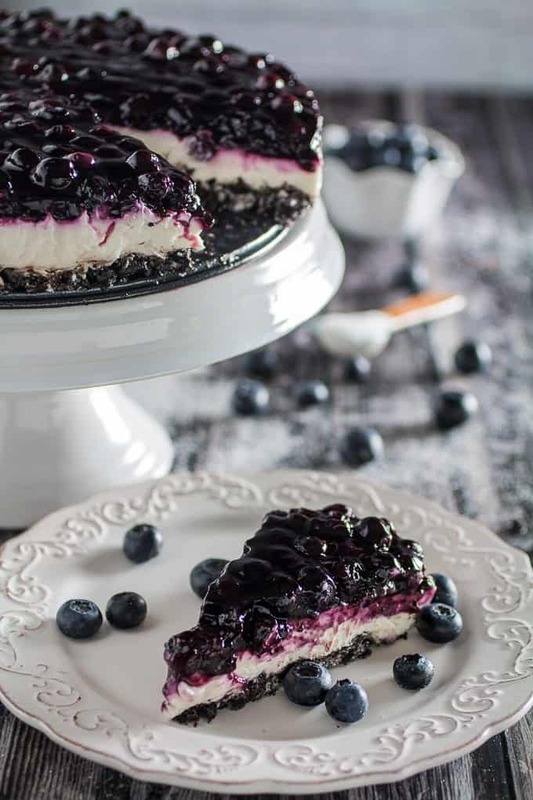 As a food blogger, I know I should be cheering for you to take on the task of baking a cheesecake for yourself. I mean, this recipe isn’t going to be exactly the same as a baked cheesecake. I could sit here and tell you that your friends wouldn’t be able to tell the difference, but that’s just not true. They’ll totally be able to tell the difference. What I CAN tell you, is that while this cheesecake isn’t exactly as close to the real thing as I wish it were, it’s still a damn good dessert. Plus, it’s way easier to make than a traditional cheesecake. And in my book, damn good desserts deserve their own time to shine. If you’re really motivated to take on the big kahuna, you can check out my White Chocolate Strawberry Cheesecake recipe over here. I promise you, it won’t disappoint. I’ve even included some tips to help with the process, just in case it’s your first time. Hey, we all have to start somewhere, so why not with white chocolate? I haven’t been posting as many recipes lately. And for that, I am eternally sorry. Ok, maybe not eternally. Everyone deserves a break, right? Even food bloggers? No? Damn. I’ve been really, really busy marathoning Outlander. It’s important business. If you haven’t read the books, I highly suggest you do. They are just beyond amazing, and the series is done equally as well. While it does skip around here and there, it remains more true to the books than I’ve seen a series do in a long time. It’s adventure and romance all rolled up into a masterpiece of historical fiction. I do have some good recipes in the pipeline for you. I promise. I may even sneak a few healthy summer recipes in there for you. Like Kale chips! Mmm… kale chips. Ok, maybe I shouldn’t be discussing kale during a no bake cheesecake post. I’ll stop now. You can really use any fruit you want for this topping. Just follow the basic recipe for a glaze, sub in your favorite fruit, and bam! 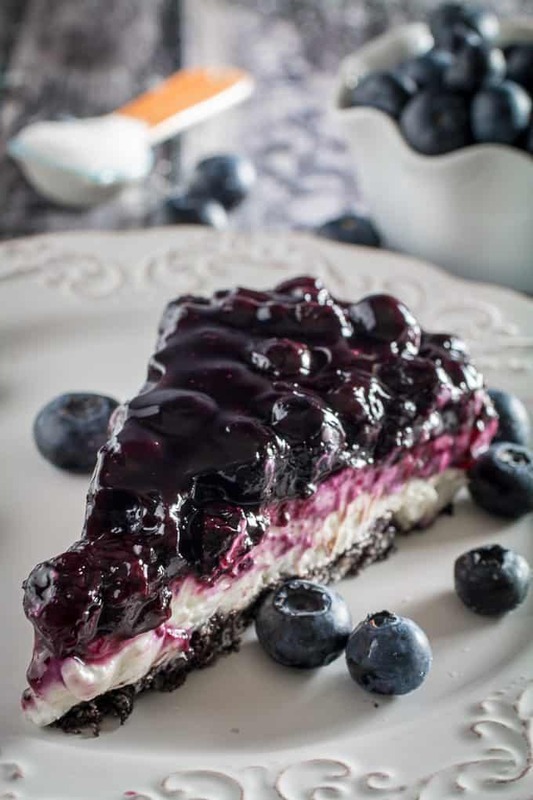 “insert your fruit here” No Bake Cheesecake. I’ve personally done this recipe with strawberries, blueberries, cherries, and apples. All of these fruits worked out really well. Are you ready for the easiest no bake cheesecake you’ll make all summer? 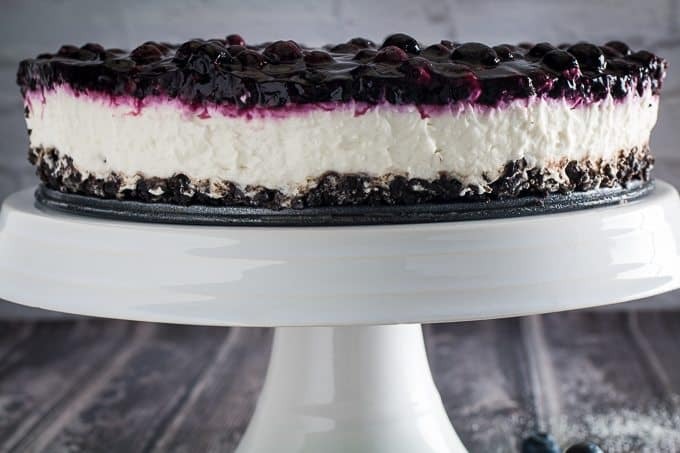 A truly simple, easy to make gluten free No Bake Cheesecake with Blueberry Topping that doesn't require any time in the oven. This deliciously creamy no bake dessert is perfect for summer days when it's just too hot to cook, but you still want something sweet to eat! In a bowl, pour melted butter over crushed cookies and mix together until completely combined. Press cookies into springform pan, spreading evenly. Pour whipping cream into a stand mixer bowl. Add cream of tar tar and whip on med-low speed, until cream begins to form stiff peaks (about 3-5 minutes). Move whipped cream to a separate bowl. In a clean bowl, use stand mixer to beat together cream cheese, lemon juice, sugar, and vanilla extract. Slowly add whipped cream into cream cheese mixture, until just combined. Pour filling into springform pan, spreading evenly over cookie crust. Add blueberries, vanilla extract, sugar, and lemon juice to a saucepan. Whisk together water and corn starch, and pour over fruit. Cook on medium heat. Lower heat to a simmer and allow to thicken (about 5 minutes). Once completely cooled, pour filling over cheesecake. To set, refrigerate cheesecake for 2-3 hours before serving.